Did you have a chance to watch the new Mars Rover move around its temporary home in the clean room at JPL before it drove itself out of camera range? Today’s wallpaper was taken during the June 3rd mobility testing, which I would have missed if I wasn’t a slave to my twitter feed. 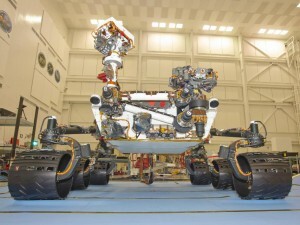 Try to catch up with Curiosity via JPL’s Curiosity Cam or follow the mission on twitter @CuriosityRover. Also, don’t be an idiot like me and instinctively type in the British spelling of ‘curiousity’ when you’re searching for mission data. That will turn into a #FAIL pretty quickly. UPDATE: The Rover make its final appearance on camera at NASA’s Jet Propulsion Laboratory on Thursday, June 16, 7:30 to 10 a.m. Watch! Drat, I was too late–the Rover’s all wrapped up. If it makes you feel better, I didn’t get to watch its last run, either.